*Disclaimer: we do not buy or sell leads. This page is an overview of the mortgage lead generation industry. The mortgage industry is in transition. Although it’s valued at just a fraction of what it peaked at prior to the recession, the industry has been steadily growing since 2011. However, as the industry recovers, any expectation of rapid growth is tempered by an increase in government regulation and a shift away from loan brokerage services according to IBISWorld Market Research Report. Commercial banks have begun to circumvent independent mortgage brokers and consumers have followed suit as they place their trust in large banks and government organizations. While this shift has certainly affected many players within the mortgage industry, it has had a unique effect on mortgage lead generation companies. Because the mortgage industry is on the rebound, this exact industry atmosphere lends itself perfectly to mortgage lead generation. As brokers begin to lose business to commercial banks, they need to search for new ways to acquire clients. That’s where mortgage lead generation companies come in. Brokers can’t afford to expend the time and energy marketing to prospects. Instead, they turn to lead generation specialists that will sell them leads in real-time. Generating mortgage leads works the same way that most lead verticals do. You prompt the customer to either fill out a web form or call your marketed number and the lead is routed in real-time to one of your buyers. This will also work if you buy mortgage leads from a 3rd party and resell them. 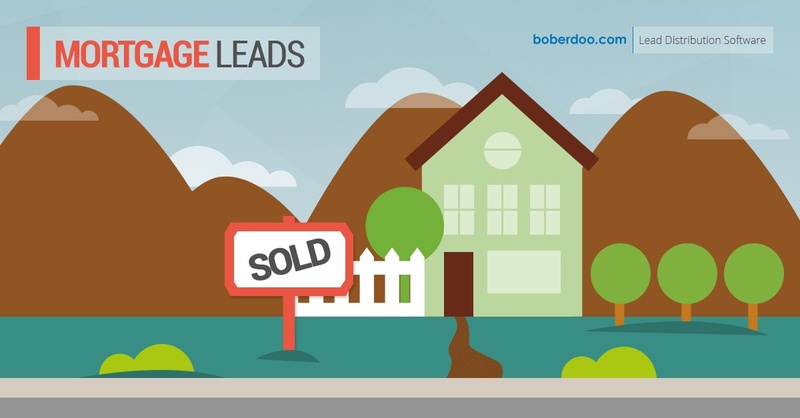 The boberdoo.com lead distribution system was originally built exclusively for selling mortgage leads. Although the system has evolved to handle leads and calls in any vertical, you can rest easy knowing that our clients have been selling mortgage leads through boberdoo for over 17 years. With the most advanced distribution options, custom deliveries to any CRM or LMS and a plethora of billing options, boberdoo provides a complete back end system for running not only your mortgage lead vertical, but your entire lead business. If you are looking to upgrade your lead generation business or break into the mortgage vertical, you can do no better than boberdoo.com. If you would like to discuss mortgage leads or the boberdoo lead distribution system, please give us a call at 800-776-5646.
boberdoo builds lead distribution software for lead generation companies. We also have a few other services such as Outbound Automation, Premium Dashboards and leadQC. We DO NOT SELL mortgage leads. If you are looking to purchase leads, please submit an inquiry and tell us who your current suppliers are and we can make introductions to boberdoo clients in that vertical.